Tonight! Come celebrate International Animation Day with ASIFA ATLANTA. Each year in October, ASIFA chapters all over the world collect their best locally produced animated short films and exchange with global partners. In recognition of International Animation Day, ASIFA Atlanta is screening selections from Portugal, Australia, Brazil, and Japan, this evening at 6pm at the Five Spot in Little Five Points. 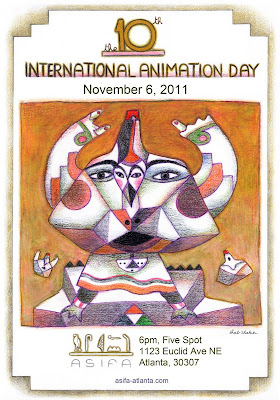 Selected short films include a variety of animation styles, including stop-motion, 3D, traditional and experimental techniques.